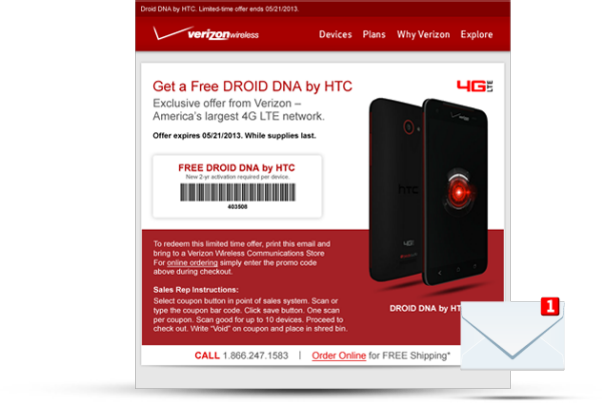 The HTC DROID DNA, which could easily be considered Verizon’s best available phone (our review), can be had for free thanks to a new coupon code and referral program that Big Red is running through May 21. All you have to do, is click through on the source link below, type in your email address, and wait for your coupon code to arrive (should take only a couple of minutes). Once you have it, you can print out the code and redeem it inside a Verizon or store, or use it during checkout through their online shop. Verizon is currently charging $199 on new 2-year contract for the DNA, so this promo will save you almost $200. In order to receive the phone for free you do need to sign a new contract. The promo also allows you to refer friends who are not currently Verizon customers. Should you refer them, Verizon will give you $25 per. Keep in mind that the Samsung Galaxy S4 will be available starting May 23 and that there is still a chance that Verizon carries a version of the HTC One down the road.